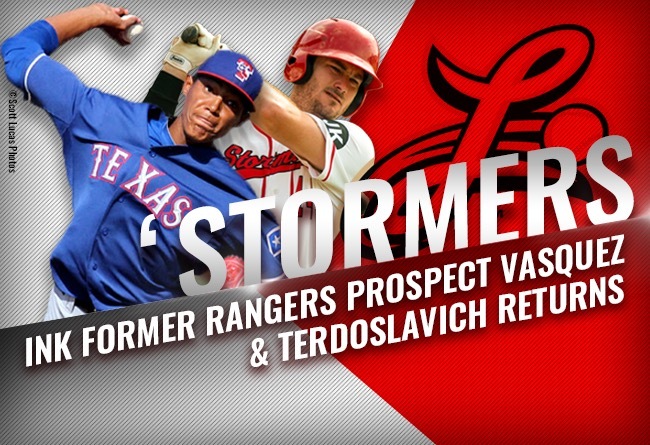 (Lancaster, Pa., March 6, 2019) - Joey Terdoslavich, who homered in his first two at bats at home in 2018, has re-signed with the Lancaster Barnstormers for the 2019 season, it was announced today by manager Ross Peeples. In addition, Lancaster has also inked a contract with right-handed pitcher Kelvin Vasquez, a former Texas Rangers farmhand. Terdoslavich, 30, opened the 2018 campaign with the Barnstormers and made an immediate impact during the home opener, reaching York for a two-run homer in the first inning and a three-run shot in the second, leading the ‘Stormers to a 13-5 rout of their archrivals. Overall, the former Atlanta Braves corner infielder, batted .275 with six homers and 28 RBI in 40 games for Lancaster in his inaugural Atlantic League campaign. His contract was purchased by the New York Mets on June 14, and the switch hitter spent the remainder of the season at Class AA Binghamton, where he played with former Heisman Trophy winner Tim Tebow. With the Rumble Ponies, Terdoslavich hit .308 with 12 homers and 41 RBI in 74 games. Terdoslavich spent a portion of three seasons with the Braves from 2013-15 after signing with Atlanta in 2010. He has also spent time in the Pittsburgh and Baltimore farm systems. Vasquez, who turns 26 in April, signed with the Texas Rangers in 2011. The right-hander spent seven seasons in the Texas system, he moved to the Atlanta Braves organization last year. For the first time in his eight-year career, he reached the Class AAA level with one appearance for Gwinnett. The native of the Dominican Republic spent the bulk of the season at Class AA Mississippi where he was 3-2 with a 5.59 ERA in 29 appearances. With the signings, the Barnstormers now have 15 players under contract for the 2019 campaign.